Paytm WiFi: Paytm is going to provide free internet via its Patym WiFi plan across the nation. As of now, not too much details are out yet regarding it. Paytm Wi-Fi will initially be launched in beta. At first, it will be launched in beta for the testing purposes. Patym founder Vijay Shekhar Sharma posted about it on his Facebook wall. Vijay mentioned that WiFi service is underway currently. 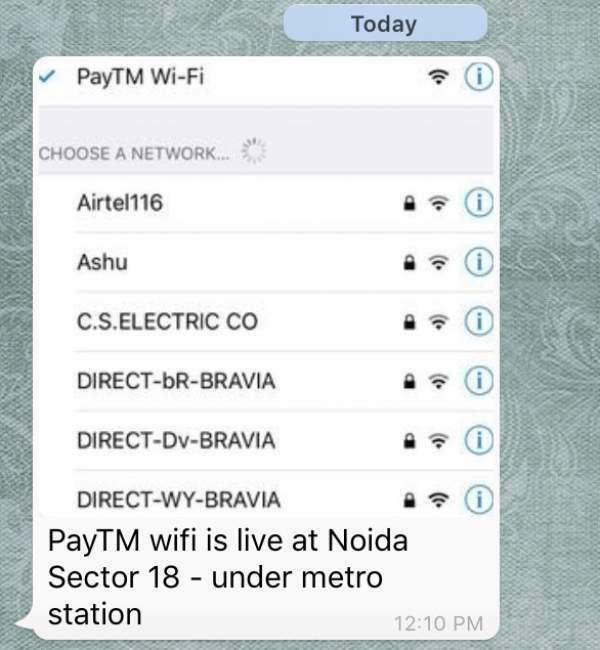 He posted a screenshot of a phone’s WiFi network where the device is connected to PayTM Wi-Fi at Noida Sector 18 Metro Station. Sharma said that in the near future, people will be able to get free access to the Internet to use Paytm. However, now the main question which arises is that whether PayTM WiFi will be utilized to access the whole of the Internet or just Paytm. Stay tuned to The Reporter Times as we will keep you updated with the latest information regarding it. Previous articleSuhani Si Ek Ladki 15th April 2016: Suhani taught a lesson to her daughter; Yuvraj and Yuvaan teams up !